The Monastery of St Gerasimus, one of the earliest of the 70-plus monasteries in the Judaean desert, is named in honour of a pioneering monk who is usually depicted with a pet lion. A verdant and welcoming oasis in the arid lower Jordan Valley, it is on the east side of highway 90 just north of the Beit-Ha’aravah junction, and about 7 kilometres southeast of Jericho. 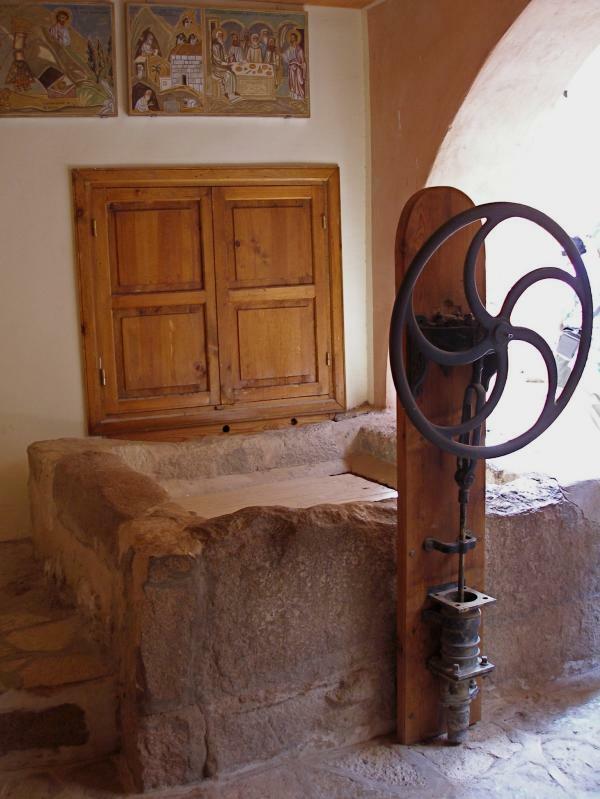 Across the Jordan River is the place of Jesus’ baptism, Bethany Beyond the Jordan, but the two-storey monastery commemorates an earlier event in Jesus’ life. According to an old tradition, the monastery was built where Mary, Joseph and the infant Jesus took shelter in a cave while fleeing from Herod the Great. This event is commemorated in the ground-floor crypt beneath the monastery church. An icon illustrates the Flight of the Holy Family into Egypt and a large painting depicts a contented Jesus being nursed at the breast by his mother Mary. The upper-floor church contains many holy icons and frescoes, including paintings of Gerasimus and his lion. Cabinets in the crypt store the bones of monks killed during the Persian invasion of 614. A place of hospitality and refreshment for pilgrims, with fruit trees, flowers and birdsong, the gold-domed monastery offers a contrast to the hot and barren environment of the Judaean wilderness. Founded in the fifth century, it was originally dedicated to Our Lady of Kalamon (Greek for reeds), but was later renamed in honour of Gerasimus, who founded a nearby monastery that had been abandoned. It was destroyed in 614, rebuilt by the Crusaders, abandoned after the Crusader period, restored in the 12th century, rebuilt in 1588, destroyed around 1734 and re-established in 1885. In Arabic it is known as Deir Hajla, meaning the monastery of the partridge, a bird common to the area. The monastery functioned in the form of a laura — with a cluster of hermits’ caves located around a community and worship centre. The hermits spent weekdays alone in their caves, occupied in prayer and making ropes and baskets. They went to the centre for Saturdays and Sundays, taking their handiwork and partaking in Divine Liturgy and communal activities. The monastic rule was strict. During the week the hermit monks survived on dry bread, dates and water. At the weekends they ate cooked food and drank wine. Their only personal belongings were a rush mat and a drinking bowl. Hermits’ caves can still be seen in the steep cliffs a kilometre east of the monastery and in the adjacent mountains. 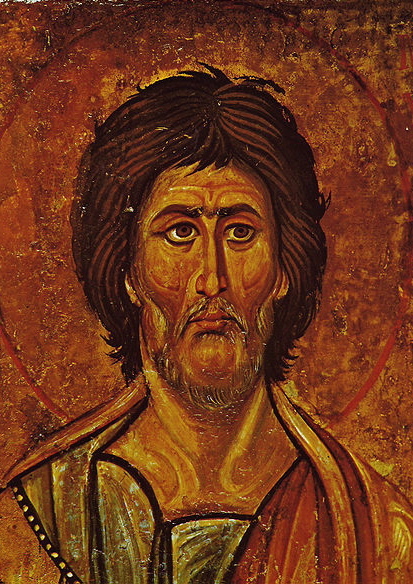 Like many who founded Judaean monasteries, Gerasimus (also spelt Gerassimos or Gerasimos) came from outside the Holy Land — from a wealthy family in Lycia, in present-day Turkey. Already a monk when he came to Palestine, he followed the monastic leader Euthymius into the desert and became renowned for his piety and asceticism. Because of the similarity of names, Gerasimus is sometimes confused with St Jerome, the Bible translator who lived in Bethlehem. Gerasimus is credited with a new development in monastic life. Previously desert monks lived either in caves or in monasteries. He was the first to combine the solitude of a wilderness hermit with the communal aspect of a monastery by bringing hermits together on Saturdays and Sundays for worship and fellowship. He is believed to have attended the crucial Council of Chalcedon in 451, which caused a major rift in the Eastern Orthodox world. Called to settle differences of opinion on the nature of Christ, the council declared that he has two natures in one Person as truly God and truly man. Gerasimus briefly opposed this declaration, then accepted it. The lion depicted in icons of Gerasimus comes from a story that he found the animal wandering in the desert, suffering from a thorn embedded in a paw. The saint gently removed the thorn and tended to the wound. The lion thereafter devoted himself to Gerasimus, serving him and the monastery and retrieving the monastery’s donkey when it was stolen by thieves. The story has it that when Gerasimus died in 475 the lion lay on his grave and died of grief. St Catherine’s Monastery in Egypt’s Sinai Peninsula is believed to enshrine the burning bush from which God first revealed himself to Moses. It also contains a treasure trove of icons and ancient manuscripts. 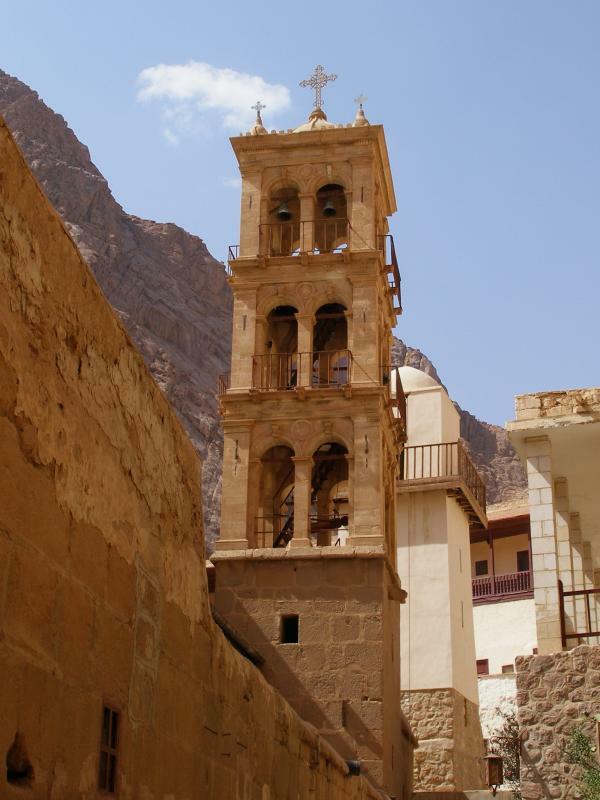 St Catherine’s, an Orthodox establishment, is one of the oldest Christian monasteries in the world and has been the centre of monastic life in the southern Sinai. 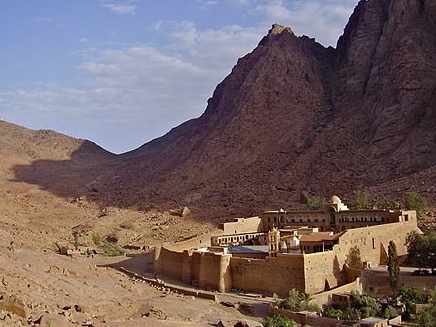 Monks have lived here, in the shadow of Mount Sinai, almost without interruption since the Byzantine emperor Justinian built the monastery in the 6th century. An earlier chapel on the site is said to have been erected on St Helena’s orders in 337. Since the location was difficult to protect from marauders, Justinian surrounded the monastery with a high wall of close-fitting granite stones, about 2 metres thick. Most of what can be seen on the site today dates back to the 6th century. 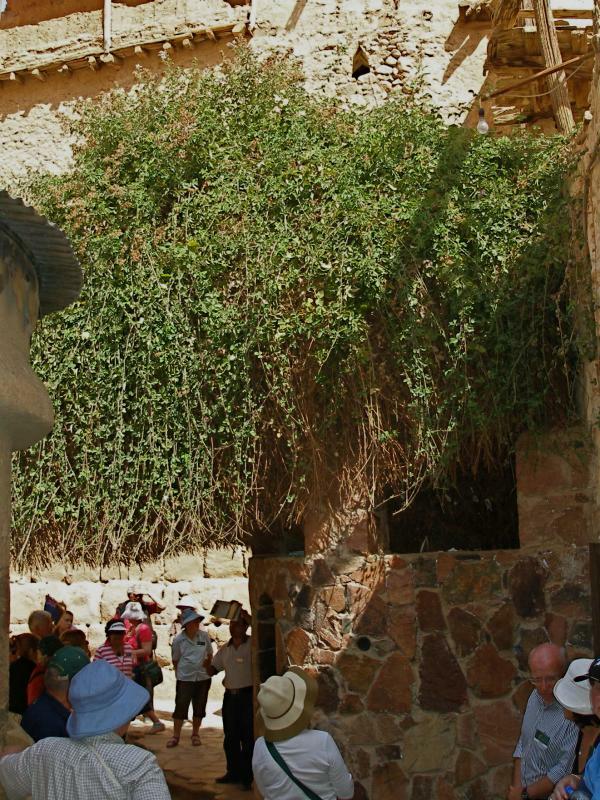 The holiest part of St Catherine’s Monastery is the Chapel of the Burning Bush, a small chamber behind the altar of the basilica. It is often closed to the public and those who enter must remove their shoes, just as Moses did when he approached the burning bush (Exodus 3:2-5). Under the chapel’s altar is a silver star which is believed to mark the site of the bush from which God called Moses to lead his people out of Egypt. The reputed bush was transplanted several metres away. The pilgrim Egeria, who visited between 381 and 384, described it as “still alive and sprouting”, and situated within a pretty garden. The bush or its successor, now sprawling over a protective stone wall, still lives and is carefully tended by the monks. Since the Bible narrative says the bush was not consumed by the flames, the Orthodox name for it is the Unburnt Bush. The bush is a bramble of the rose family called Rubus sanctus, which includes the raspberry and blackberry. A native of the Holy Land, it is extremely long-lived. The monastery’s bush neither blooms nor gives any fruit. St Catherine’s Monastery also encompasses the Well of Moses, also known as the Well of Jethro, where Moses is said to have met his future wife, Zipporah. As recounted in Exodus (2:15-21), Moses was resting by the well when the seven daughters of Jethro (also called Reuel) came to draw water. Some shepherds drove them away and Moses came to their defence. In gratitude, Jethro invited Moses to his home and gave him his daughter Zipporah in marriage. The well is still one of the monastery’s main sources of water. St Catherine’s Monastery is renowned for its art treasures. Its collection of more than 2000 icons is probably the largest in the world. Its library of 4500 ancient Christian manuscripts is second only to that of the Vatican Library in Rome. The monastery’s isolation saved its oldest icons during the 8th century when the Byzantine emperor Leo III ordered the destruction of any imagery depicting Jesus or one of the saints. These early icons are naturalistic and free from stylisation and the rules that later icons followed. A selection from the icon collection is always on display in the basilica. The ancient manuscripts are mainly in Greek, but also in Arabic, Armenian, Coptic, Georgian, Slavonic and Syriac. Only one is in Latin. Some are exquisitely illuminated. The monastery no longer contains its most precious manuscript. This was the Codex Sinaiticus, a 4th-century copy of most of the Bible in Greek. It was discovered in 1844 by a German biblical scholar, Friedrich Constantin von Tischendorf, who obtained it for Tsar Alexander I of Russia. Whether the codex was to be returned is disputed. Most of it is now in the British Museum, to which it was sold by the Soviet Russian government in 1933 for $100,000. In 2009 an international project placed the full text online. The most outstanding art treasure in the monastery is an unusual mosaic of the Transfiguration of Jesus, above the altar in the apse of the basilica. This well-preserved mosaic from the 6th century can be glimpsed behind the gilded iconostasis that dates from the 17th century. Christ is shown in glory in an almond-shaped panel of greys and blues, wearing a white mantle edged with gold. His halo has a gold cross on a white and gold backing. Around him are the prophets of the Sinai, Moses and Elijah, and the disciples John, Peter and James. The inside rim of the arch is decorated with medallions of the 12 apostles, with Paul, Thaddaeus and Matthias replacing those in the Transfiguration composition. The monastery is actually dedicated to the Transfiguration, but it was renamed for St Catherine of Alexandria, a 3rd-century martyr. According to tradition, this happened after monks found her incorrupt body, which had been transported by angels to the top of Mount Catherine (Jebel Katharina), the highest mountain in the Sinai. To the right of the altar in the basilica is a marble sarcophagus with two silver caskets containing the saint’s skull and left hand. Because the ground is rocky, the monks created the monastery garden by bringing soil from elsewhere. It contains fruit trees including olives, apricots and plums, and produces a variety of vegetables. Nearby are the cemetery and charnel house. When monks die they are first buried in the cemetery. After their bodies decay, their bones are exhumed and transferred to the charnel house. In the charnel house can be seen the bones of thousands of deceased monks, with separate piles for legs, hands, feet, ribs and skulls. Martyrs and archbishops are in open coffins. Inside the door, dressed in purple robes, sits the skeleton of Stephanos, a 6th-century guardian of the path to Mount Sinai. An unusual feature of the monastery compound is a mosque. Originally built in the 6th century as a hospice for pilgrims, it was converted to a mosque in 1106 for the use of local Bedouin, some of whom work at the monastery. Of the monastery’s four original gates, three in the northwestern wall have been blocked for hundreds of years. Until the middle of the 19th century, access was by basket and pulley to a gate about 9 metres above ground level in the northeastern wall. Then a new gate was opened in the northwestern wall.